Moon Girl and Devil Dinosaur is an absolute hoot. 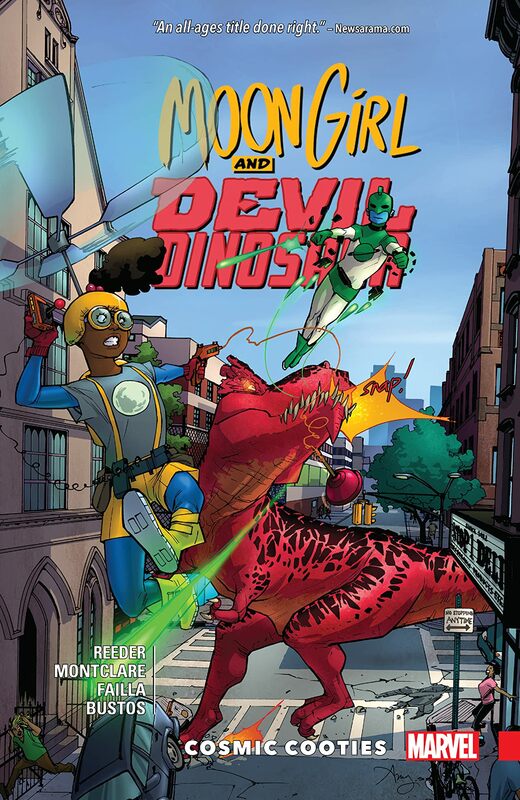 Moon Girl is 9 year old Lunella Lafayette and Devil Dinosaur is her pet Tyrannosaurus Rex. Lunella is a child prodigy, super clever and can build just about anything. She is exposed to the Terrigen Cloud which turns her into an Inhuman and gives her a superpower, but it's not what she expects and it's not an easy or convenient power. On top of this, a boy from the Kree homeworld has arrived on earth to capture her. This is an all ages title and it's such good fun. The art is superb. It's cartoony and vibrant and so easy to read. Cosmic Cooties is the second volume in the series but perfectly easy to jump into.